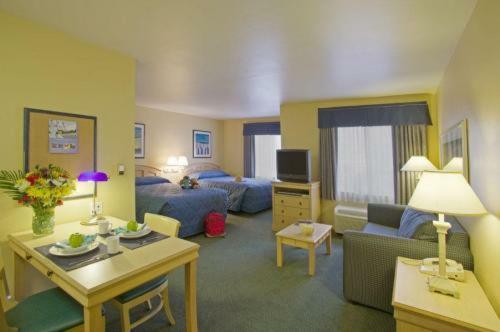 It is a clean hotel, It have everything you will need , kid friendly place from 1 to 10 age. It is a nice place to stay. All is good no negative. 1st time at this Extended stay hotel. The others I have stayed at are also very good. All had fridge so I could bring my drinks & microwave for heating up food I brought or leftovers from restaurant. Good parking & locale. Within walking distance- restaurants, gift shops. 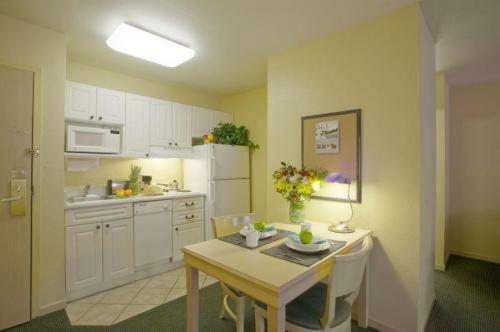 Continental breakfast with fridge & microwave, close to dining & sea world, extra couch. The hotel was nice. It was in the right area we could walk instead of driving. The Extended Stay Deluxe Orlando Convention Center Pointe comprises 137 suites designed for the longer stay business or leisure traveler. Items included with the room rate are a continental breakfast, local telephone calls, shuttle to nearby attractions and parking. The property is close to the Orange County Convention center and three miles from the Universal Studios theme park and Sea World. Other area landmarks and attractions include numerous golf courses, Walt Disney World, the Wet 'n Wild water park, the Islands of Adventure amusement park, Gatorland, the Florida Citrus Bowl, Amway Arena, home of the Orlando Magic basketball team and shopping at the nearby Pointe Orlando Mall, Fashion Square Mall and the Florida Mall. 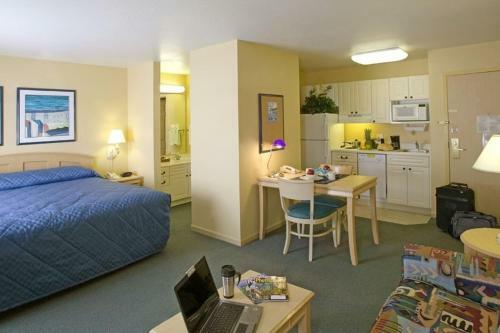 All the suites have separate living and sleeping areas and a kitchen with a stovetop, full-size refrigerator with icemaker, dishwasher and cookware and utensils. Other amenities include an iron and ironing board, television with cable news and movie channels, workspace with computer dataport and two-line telephone with voicemail and speakerphone. There is a one-time $4.99 charge for Internet access. This hotel has an outdoor heated swimming pool, Jacuzzi and a fitness center. The complimentary breakfast is the only meal served here. Restaurants nearby include a Bahama Breeze, Charlies Steakhouse, Houlihans, TGI Fridays and a Fish Bones. The 24-hour reception desk has safe deposit boxes and information on the Orlando events and attractions. There is a guest laundry, games room, daily housekeeping, same-day dry cleaning service and ice and vending machines. Many travelers who stayed at this Extended Stay said it was a good decision. 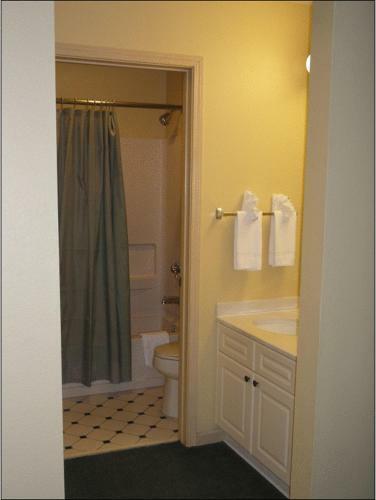 The location was great, close to the busy International Drive tourist strip but far enough away to avoid the traffic noise, the suites were clean, comfortable and spacious and the team of employees provided fast and efficient service. Families who stayed here said the rates were better than nearby hotels and the kitchen enabled some home cooked meals thus saving on some restaurant bills.